#Foodthanks to our Amazing Customers | Butcher Block with a Side of Farming! There are numerous hands that go into the creation of our Thanksgiving meals. From the farmers working the fields to the final retailer or restaurant, America's extensive food chain is fascinating. While we are truly thankful for all those steps from farm to plate, today we give #foodthanks for you. Our customer. Our friends. Our extended family. We are humbled and blessed by the community that surrounds us. You are the real stars. You've welcomed us into your homes to share in your family traditions. We could not be more honored. Without you, our faithful and loyal customers, our family business would not exist. You make it possible for us to continue doing what we love to do. Your continued support of local agriculture and our family’s passion of butchery is a daily blessing. That's still not enough. We want to show even more appreciation. Sooooo, join us on facebook for a giveaway! Yep. Free stuff. Not just any 'ol free stuff. I'm talking Award Winning Kentuckiness. So what's the loot? A Grand Champion Kentucky Made Harper's Country Ham. What's not to love there? Not local to us? Don't worry. This giveaway applies to you to. We'll ship it anywhere in the Continental United States. Your in! Details on how to be eligible to win our Hamtastic freebie will follow in the next few days. We're not stopping there. We are truly grateful for those that have taken the leap of faith with us and joined us on our fledgling journey of our Online Meat Market. Sooooo, to everyone... EVERYONE that has placed an order online with us is getting a $15.00 cold hard - no strings attached - credit added to your account to use on ANY future online purchase with us. How cool is that? We appreciate you! Check your account. Grab something special for a friend, co-worker, family member, or just treat yourself to a lil sumpin sumpin. You deserve it. Thank you for allowing us to be a part of your memories. 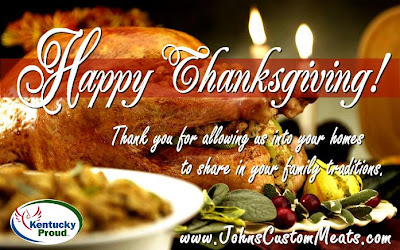 May your families be blessed and your meats be fantastic! We wouldn’t have it any other way.